I receive a lot of emails from readers and listeners who are new to shortwave radio. The bulk of the emails I receive ask for advice about which radio to pick for travel, for home, or for work. A lot of emails, however, are from listeners who wish to improve the performance of their portable radios. One of the first things I suggest–especially if they’re hearing a lot of interference noise on the radio–is simply to unplug the AC adapter (a.k.a., “wall wart”) and run the portable off batteries. Why? Quite often, those wall warts are injecting a lot of noise into your receiver. Find it hard to believe? Give it a try! Not all rechargeable batteries are created equal. Choose name-brand, higher quality cells. Dollar store batteries lack longevity and capacity. I get so annoyed with noisy wall warts, that I simply never use them. Instead, some time ago I started investing in rechargeable batteries. Though one pays a bit more for them (than for alkaline batteries) initially, they can be recharged hundreds of times, and thus last for years. You can buy rechargeable batteries nearly anywhere these days, and the price has dropped significantly over the past few years, even for name-brand batteries. It’s worth noting that I’ve bought rechargeable batteries at radio hamfests or dollar stores that were as cheap as $1US per AA cell. Big mistake–not only do these ultra-cheap batteries not hold a charge for long, but they also wear out more quickly. Instead, stick with name brand rechargeables, like Energizer, Duracell, RadioShack, or (my personal favorite) Powerex. About 85% of the shortwave portables I own are powered by AA cells, the remaining 20% off of AAA’s (you’ll find that I gripe about the ones that use AAA’s, by the way). When I buy a new portable–one that I plan to keep after reviewing on SWLing.com–I invest in twice the number of rechargeable batteries that the portable holds. For example, my Sony ICF-SW7600GR operates on 4 AA cells, thus I bought a pack of 8 cells for its operation. That way, I can always have an extra set of charged batteries available when I deplete those in the unit. There are three main types of rechargeables available: NiCd (nickel cadmium), Lithium Ion, and NiMH (nickel-metal hydride). Without going into too much detail, I recommend NiMH batteries–they offer the best bang for the buck, are widely available, and with correct care, do not easily develop a memory effect. Nickel-based cells, such as our NiMH’s need to be fully discharged occasionally, else the batteries lose capacity over time in a phenomenon known as the “memory effect.” Once my radio has depleted its current set of batteries, I’ll often pop them into a flashlight to deplete them even further before recharging. Label your batteries with a piece of colored tape or a marker to note the purchase date on the cell–that way, you’ll easily keep like batteries together and charged in sync. The Maha MHC9000 is pricey, and you will need the manual to operate it, but it's a very high-quality battery charger and conditioner. I have brought nearly dead NiMH batteries back to life with this wonderful machine. Like batteries, not all chargers are created equal. You should opt for a higher-quality, NIMH-specific charger. 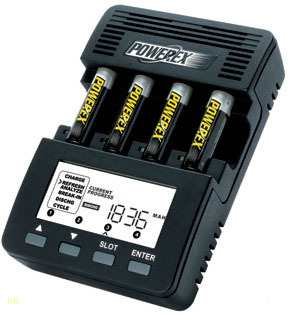 Ideally, since most radios require 3-4 batteries at a time, purchase a charger that will hold at least 4 batteries. Personally, I’ve found it helpful to own three chargers: one for rapidly charging batteries (the Maha MH-C401FS-4), one for conditioning and charging batteries (the Maha MH-C9000) and one that is solar powered (which I use only in a pinch). You can see that I’m very fond of the Maha brand battery chargers, though there are other good chargers on the market. Maha receives high praise from many amateur radio operators, and I’ve had excellent luck with them, too. What I especially like about the Maha/Powerex company is that they focus all of their innovation in the area of batteries and charging systems for a wide variety of uses. Throw away the wall warts! Have I convinced you yet? Don’t even bother unpacking the AC adapter that comes with your radio! You don’t really need it. “But wait,” you may be thinking, “my radio has a built-in battery charger, so don’t I need my AC adapter?” Even if your radio has a built-in battery charging function, it’s probably very basic and should only be used if you have no other option. Many of these are prone to over- or under-charge batteries, and take hours to complete this relatively simple task. Trust me: your portable shortwave reciever will perform at its best when powered by quiet, rechargeable NiMH batteries charged properly with a good-quality charger. Try it, and hear for yourself. This entry was posted in Articles, Reviews and tagged Batteries, Maha MH-C401FS-4, Maha MH-C401FS-4 Review, Maha MH-C9000, Maha MH-C9000 Review, Rechargeable Batteries, Rechargeable Batteries Review, Reviews on August 10, 2011 by Thomas.